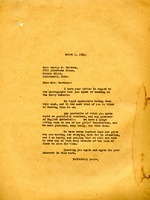 Berry sends photographs to L'Engle, with permission to publish them if desired. 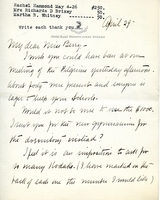 Hammond's letter (and its contemporary transcription) addresses a number to topics, including Mr. Rockefeller's reasons for not contributing to Berry and a visit to the Girls' Service Club. 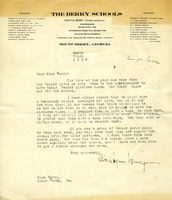 Hammond informs Berry that Louise Brigham Chisholm was not aware the cottage she donated had been built and suggests that Berry write to encourage her to visit and perhaps teach students how to build her Box Furniture. Wingo lets Berry now that it is time for the senior girls to go into Rome to have photographs made. 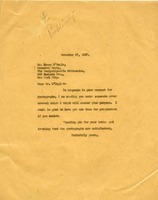 Wingo wishes the photographs could be made on site, but that has not been the custom. 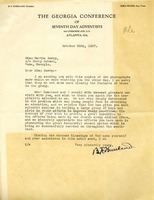 Harris & Ewing let Martha Berry know they received the returned photographs and that they will work on making the eleven photographs to complete her order. The Berry Schools send Mrs. Hammond some pictures of boys at Berry and apologize for the incorrect photos being sent. 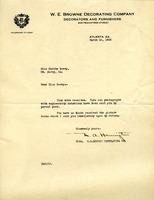 The Berry Schools also acknowledge the fact that Mr. Hammond has sent tennis rackets and to send a big thanks for them.